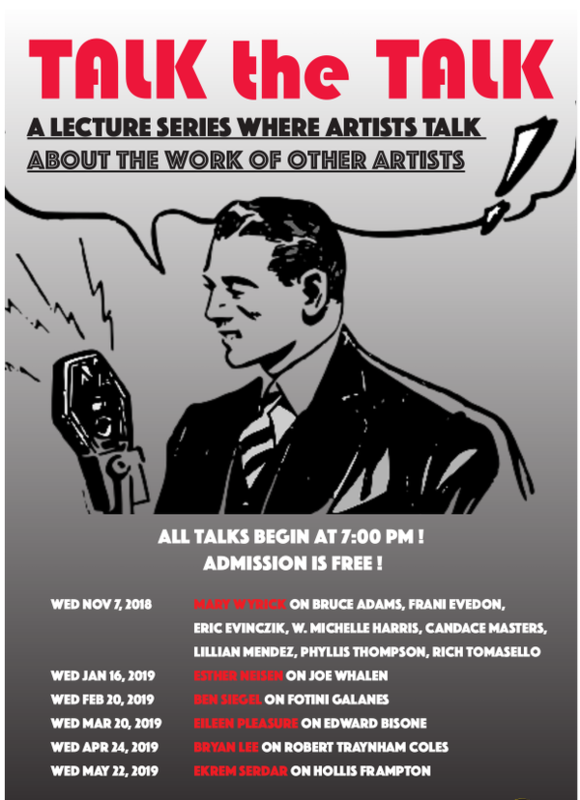 Artists' talks are a tried and true format in which artists typically speak about themselves and their work, revealing (or obscuring) their inspirations and methodologies, their backgrounds and their present modes of thinking. Hallwalls still presents live and free artists' talks at the beginning of each exhibition opening and this past summer used the annual Members Exhibition as a means within which artists could do rapid 10-minute talks on their submitted artwork. Talk The Talk is a lecture series in which we've invited regional Western New York artists and curators to present talks on other WNY artists, living or dead. We asked them to select artists they admire, artists who may have inspired them, artists whose work speaks to them sufficiently that they can then speak to us about them.